I have witnessed the devastation that sexual abuse has on an innocent child and I admit that it has made me extremely overprotective as a parent. However, as my children are now 3, 4 and 5, I have found it difficult to find the right words to talk about personal safety awareness. The DVD, Daisy Tells a Secret is such a fantastic resource that I highly recommend for all parents of children ages 4-8 (though my three year old was also able to understand the concept of the DVD too). In this simple yet powerful animated DVD, sweet little bird Daisy Raven is left home alone with her Uncle Raven who wants to play a tickling game and touches her in her private areas leaving her scared and confused. She confides in a close friend at the park who encourages her to tell her parents, explaining that there are “good secrets” and “bad secrets”. Daisy courageously tells her parents who immediately offer her support and reassure her that Uncle Raven did something very wrong and it was not her fault. We watched Daisy Tells a Secret as a family because my husband and I wanted to show my children that we were unified in our love and support for them. We were both quite impressed with the way Daisy Tells a Secret conveys a very difficult message in an unthreatening and un-scary manner that stills hits the mark with expressing the importance of good touch and bad touch and what to do if anyone touches them in an inappropriate way. It also explains the concept of body ownership and how to identify the safe adult’s that they can feel comfortable confiding in if something happens that makes them uncomfortable. My children were very engaged and the emotions on their faces helped me to know that they understood the message of Daisy Tells a Secret and really liked the animated characters. They were not frightened in any way but instead started an open dialogue with my husband telling us that we were their “safe adults” and that if anyone tried to touch them in their private areas that they would tell them “no” and tell us immediately. I also appreciated that this gives us the opportunity to talk with our children and the DVD even has a special section for parents offering helpful tips and encouragement. There are also coloring pages and Daisy Companion Instructions in the online Tool Kit. *Congratulations to Daisy Tells a Secret which has been nominated for a Telly Award and you can vote on YouTube! Won’t you take a moment to view the video and vote for this wonderful DVD……I did! 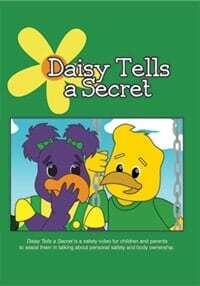 Daisy Tells a Secret is available on DVD for both parents and educators too. You can purchase this highly recommended DVD for only $19.95 (Parent’s Home Use) or the Educator’s Edition (multi-use) for $149.95. Thank you for another great giveaway. Sounds like a awesome DVD. I follow Daisy Tells A Secret on twitter. Such an Important topic. I had a very difficult time talking to my girls about this. This would be good to use with my little boy in the future. I think my niece would be interested in this!